Hello world! It feels nice to have something to blog about again, seeing as I’ve been a total hermit since suffering with an ear infection for the last two weeks and counting. 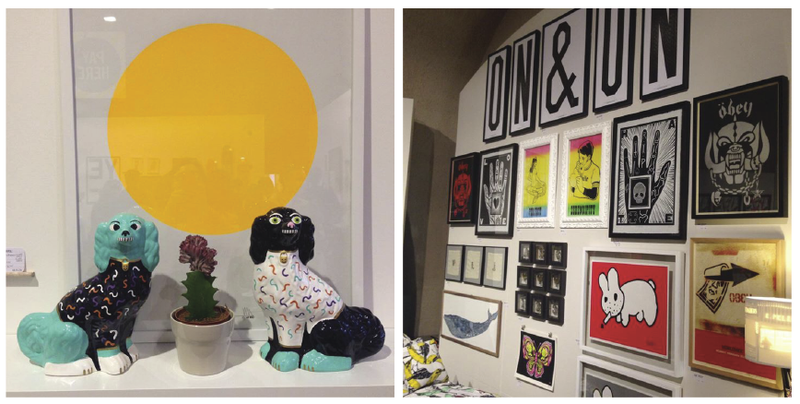 I finally ventured out to London to attend this year’s ‘Pick Me Up’ art fair at Somerset House. I missed the exhibition last year, so was excited to experience the art work and live workshops as well as gander at the beautiful pieces on sale. The first thing I felt when entering PMU was jealousy. 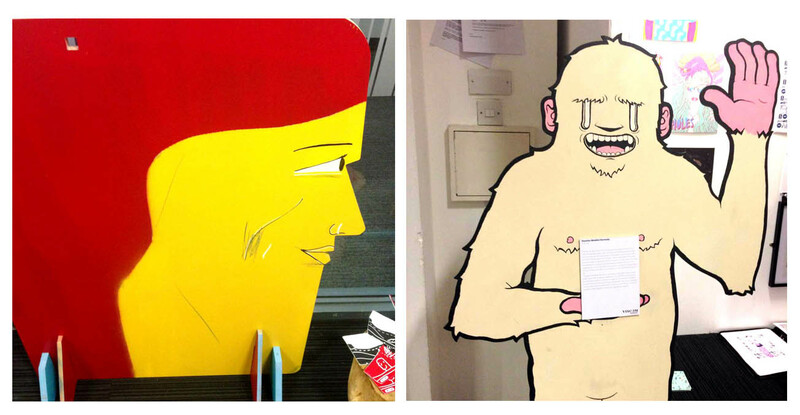 I’d love to have something to display, I hardly do any illustration any more as I just don’t really have the time. I’m lucky I get to be creative while designing at work – but I doubt anyone would go to an exhibition of my Kardashian layouts! I really liked some of the styles being displayed, the illustration work at PMU is always very strong. Pottery seemed very popular this year, and there was even a workshop going on where you could make your own. 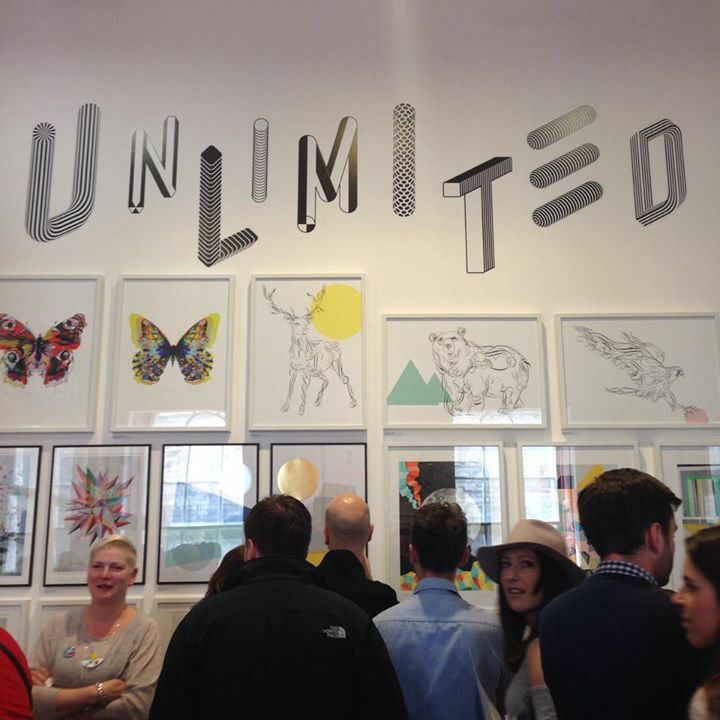 Alan Kitching hosted a special screen printing display along side a large collection of his typography work. 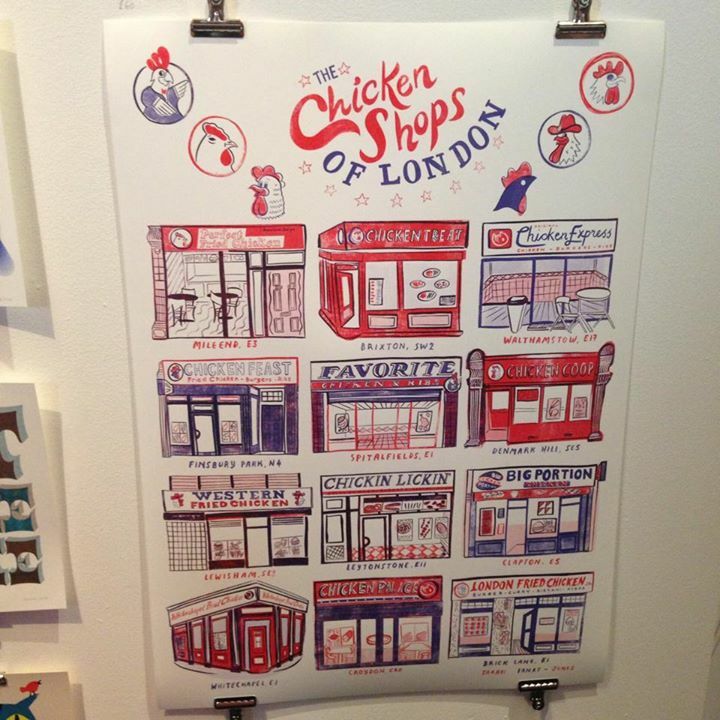 As always there was loads to buy – I loved Beach London‘s stall, that included an amazing ‘BORT’ license plate, and an awesome chicken shop logo print. Compared to when I went to PMU in 2014, it seemed that this year there was definitely a lot less art being shown, and more emphasis on the pop up shops inside, selling bits and bobs. This was a bit of a shame, as we cruised through the exhibition in less than 45 minutes, leaving us left a tad unsatisfied. I’d still recommend PMU for fun art fix, but don’t expect to be there all day! 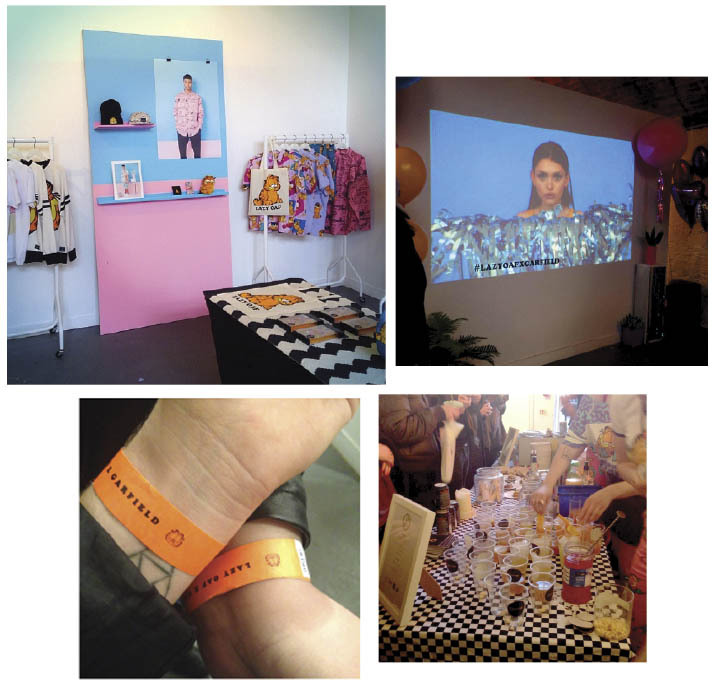 Lazy Oaf Garfield Collection //launch night. 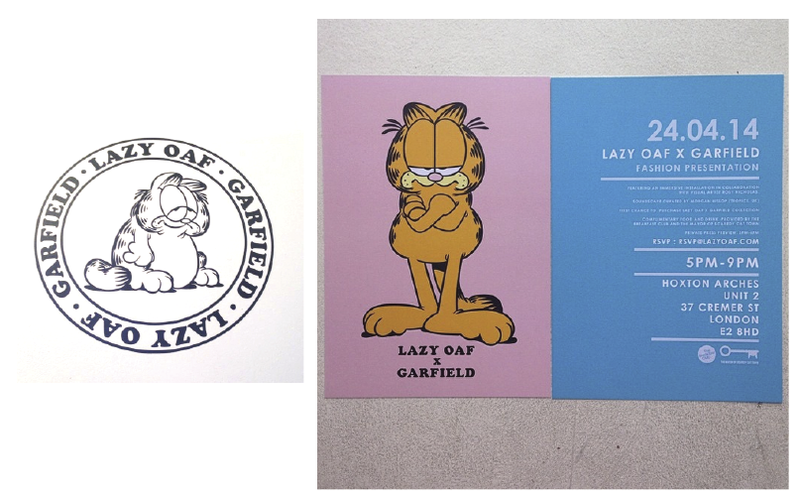 Thanks to my lovely friend Emily at Lazy Oaf, I went along to the launch night of their Garfield collaboration a couple of months ago. 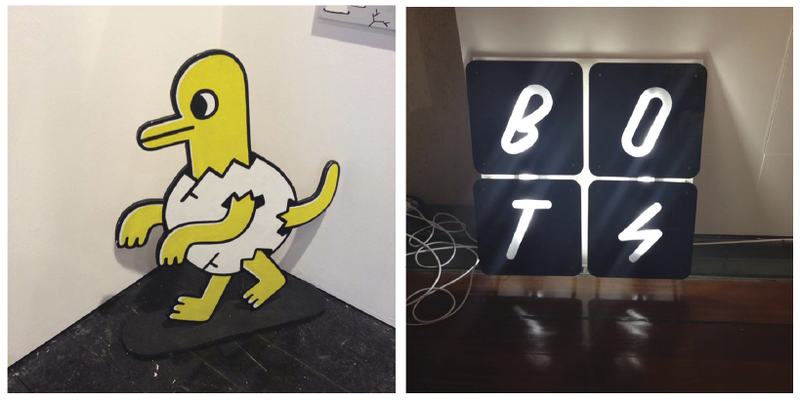 I am such a huge Lazy Oaf fan and after last year’s Looney Tunes collab launch I was so excited to attend this event. Hoxton’s arches were transformed into a real life look-book, with models posing on colourful sets, while we walked around and admiring the collection (and of course the models themselves). 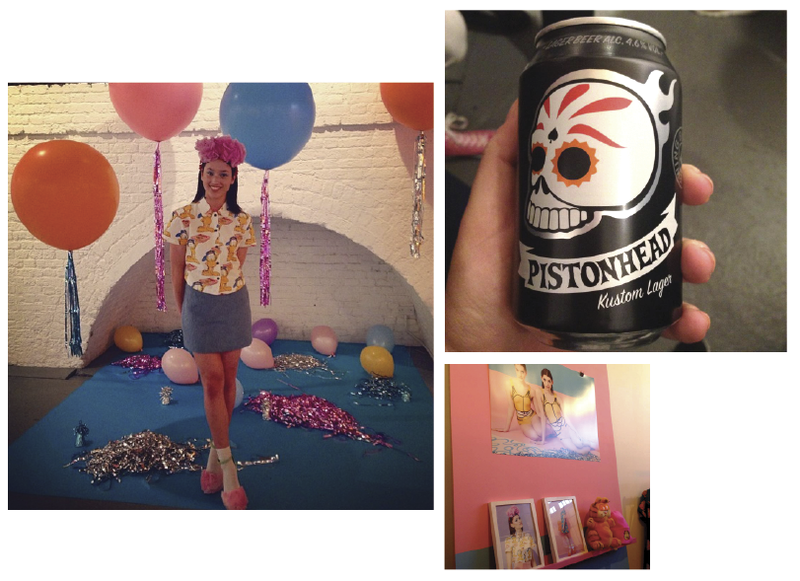 Lazy Oaf always go out of their way to create such quirky and fun events and this one was no different. I don’t know how the models managed to keep a straight face with us gawking at them and taking photos, but it was really such a unique idea which only L.O could pull off so well. Around the corner from these live sets were the booze & shop area where you could browse and buy the Garfield collection as well as grab a cocktail and a mini lasagne or cat shaped pancake from the good people of The Breakfast Club. It was a really fun night and I can’t wait for the next one. 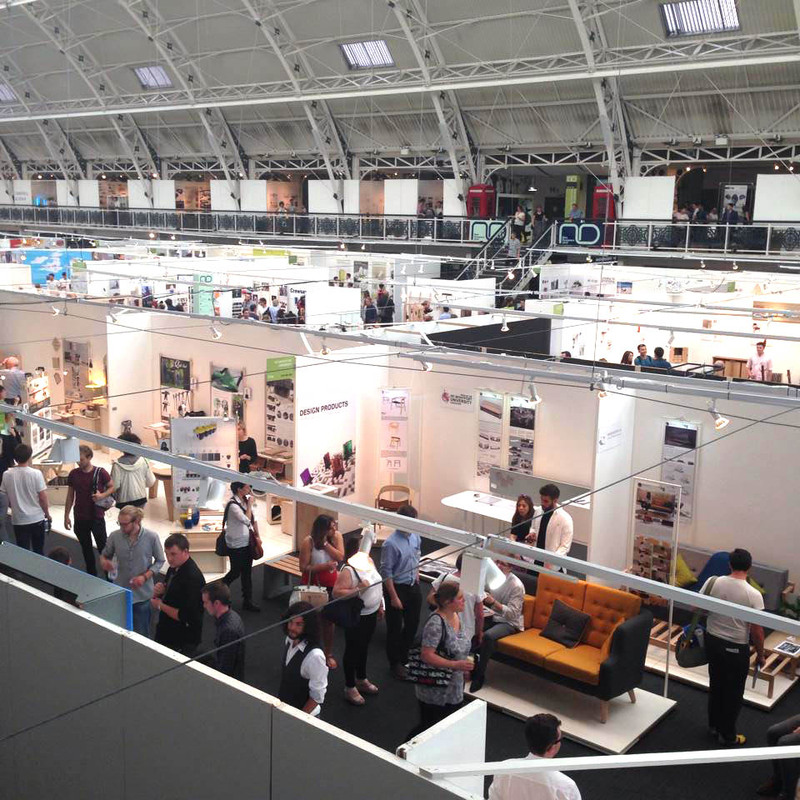 New Designers 2014//exhibition. One of my best friends was picked to be a part of the New Designers Exhibition this year. I’ve never been before, but was blown away when I got there. Students from different Universities got to display their work to potential employers, buyers and manufacturers to private collectors and design enthusiasts. It was so much fun walking around looking at everyone’s work (I’m nosy like that) and made me pine for my art school days. I especially liked some of the illustration work, as it reminded me of our Illustration Exhibition back when I was at Camberwell.. good times. My friend was showing her rebrand of the lingerie line ‘Belle’, and acted like a proud mum, making her pose in front of her stand for cringe photos. 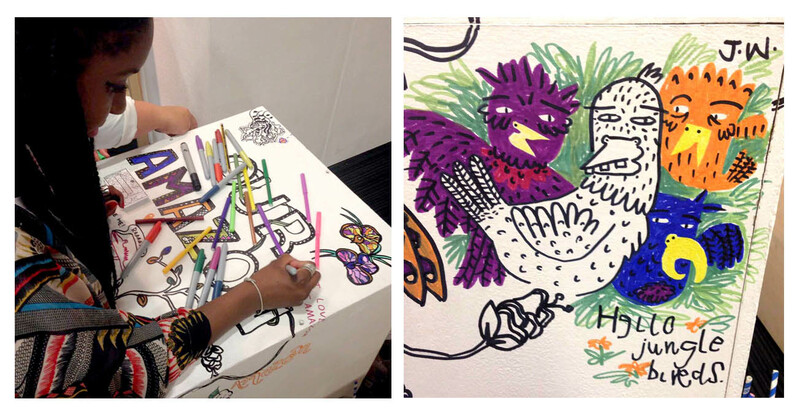 There were also interactive pieces where you were encouraged to take part to create the art – we liked colouring in the drawing box, and there was a piece that was only visible once you used a hairdryer on it. I did envy all the students, as back when I was at Uni I hadn’t even heard of this event, and there were awards given out with such prizes up to £1000, as well as an internship at Sky! Pfft.. (that’s me being jealous). All in all it was really fun and interesting, and there’s no doubt some of the people there are going to go on to big things. Pick Me Up//art fair. Every year I say I’ll go to Pick Me Up, so this year I finally made the journey to Somerset House. The exhibition was huge with so much to look at (I must have taken a few hundred photos) and I was in awe of some of the pieces on display. Don’t get me wrong, I did have a few ‘I could do that’ moments looking around, but on a whole the quality of work was brilliant, and I came away wanting to go back and re-do my Graphics degree. 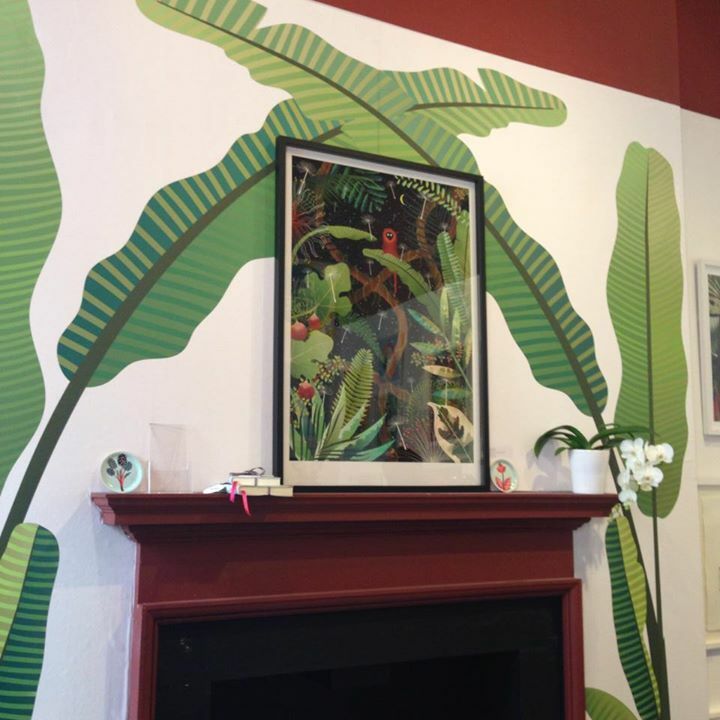 I especially liked the work which was on show in individual rooms, which themselves had been designed and curated to suit the work displayed (check out my pic of the beaut palm leaf wall – flat inspo or what). 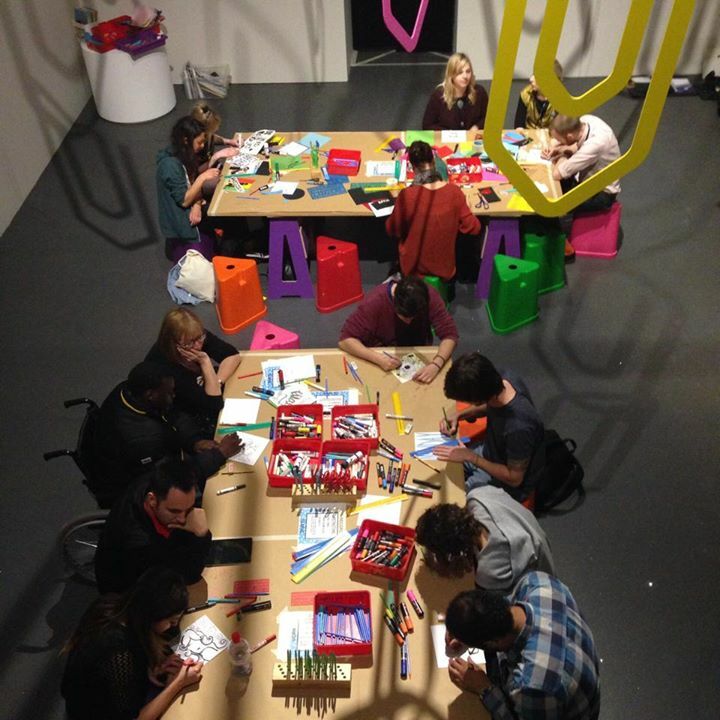 We also took part in a drawing workshop where they played different music on loop and you could design your own record sleeve.. ours were awful and instead of taking our photo with them for the Pick Me Up Instagram page, we quickly ran away when the organisers weren’t looking. Smooth. We had a lot of fun and I definitely came away feeling inspired. And again, wishing I was back at art school. Martin Creed//exhibition. Earlier this year I was suddenly seeing all these photos on social media of what seemed like people drowning in a sea of balloons, and was determined to get involved. 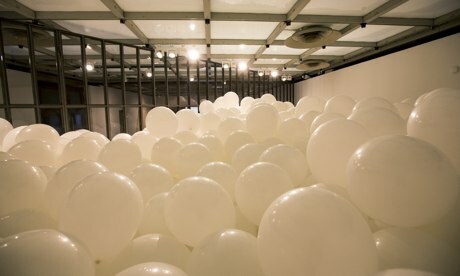 This ‘balloon room’ was a part of the Martin Creed exhibition at the Hayward Gallery, and was exactly that – a room filled to the brim with white balloons, that you could go run around in… for no reason other than it was fun. And fun it was! Except from the occasional near heart attacks I suffered whenever a balloon would accidentally pop, it was an amazing experience, and when else are you going to get to be in a situation like this?! You are in the balloon room with other people, so it was a bit dangerous to be running around when you could suddenly be smacked in the face by a stranger with the same idea – but this kind of added to the fun. As the exhibition had been open for a while when we went, the balloons seemed to have picked up a lot of stray hairs, which was slightly disgusting, so we tried to run away from the more hairy balloons. Downstairs from the balloon room there were lots of other ‘art works’ by Creed on display. I use the term ‘art works’ lightly as they were made up of among other things, a fart machine going off on loop, a door opening and closing, bits of paper scrunched up and random cardboard boxes stacked on top of each other. OH and a special screening room showing a film of a woman doing a poop. Oh Martin, you so cray-zee. It was such a fun exhibition to go to, and if it ever makes another appearance I will be first in line.